If you’re looking to design your website and don’t know where to get templates, you should go to oswd.com. The templates posted on oswd.com are all free. There are tons of designs to choose from, you might find several to your liking. The website has a section where all the top 10 most downloaded, highest rated and best contributers can be found. Very interesting for website designers. The best thing about having a source for free web templates is that it saves time and gives users a huge range of selection. My favourite so far is this one by Andreas Viklund. Simply cool! Here’s another great template called FunkyCoolBlue by VirtualFunction. Here are 3 from the site that i found funniest. A very large directory of IT Tutorials and Interview Questions can be found here. It even includes compilers and interpreters, useful articles such as password recovery, IT marketing and loads more. 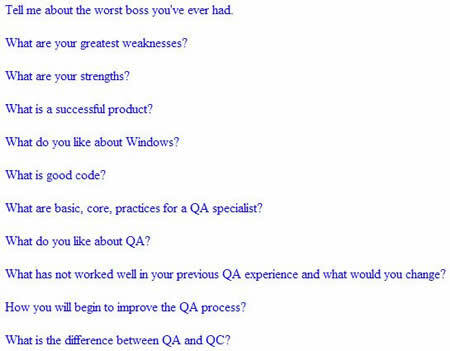 Here are several interesting interview questions that are interesting enough to ask / to be asked.